Based in Houston, Texas - Hardman Signs is a full service sign company equipped to serve businesses across the United States. Hardman Signs covers everything from the custom design, to manufacturing, and installing your new business sign. Please read on to learn more about our company. Texas Sign Company: Our Texas sign company provides cost-effective, customizable solutions to the many businesses throughout our state and beyond. Georgia Sign Company: For Georgia signs that are durable, versatile and can last for years to come, consider Hardman Signs for all of your needs. Houston Sign Company: We provide customizable, cost-effective services for clients across the Houston area. Austin Sign Company: Need Austin signage? Give Hardman Signs a call. Atlanta Sign Company: Trust our company for efficient sign design, fabrication and maintenance services. San Antonio Sign Company: Customizable San Antonio sign services help you promote your business with pride and panache. Dallas Sign Company: We offer the Dallas sign design and manufacture services that you need. 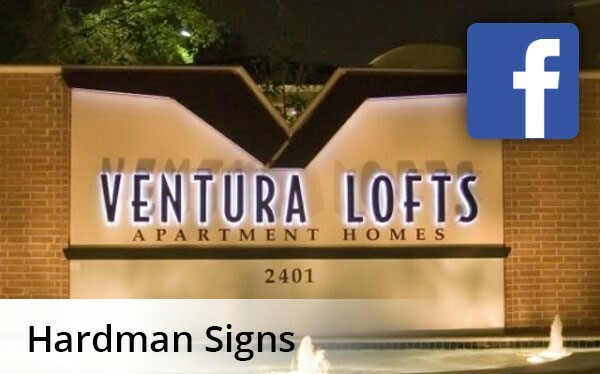 Fort Worth Sign Company: One of the top Fort Worth sign companies, Hardman Signs ensures that all deadlines and budget requirements are met with ease. Oklahoma Sign Company: Our Oklahoma signs are designed, fabricated and installed by trained, competent professionals that are experts in their fields. Florida Sign Company: Completely customizable, our cost-effective options and customer-friendly process ensures Hardman Signs is set apart from other Florida sign companies. Alabama Sign Company: Our experts work alongside you to create the Alabama signs that express your business' personality while clearly conveying your messages. Denver Sign Company: For the most effective and successful signage in Denver, trust the experienced professionals at Hardman Signs. Seattle Sign Company: When you need visually stunning and effective Seattle signage, trust the experts at Hardman Signs. We operate across sign service areas unparalleled in size, and we look forward to working with you. To learn more, fill out our no-obligation quote form to receive your FREE estimate or call us today.